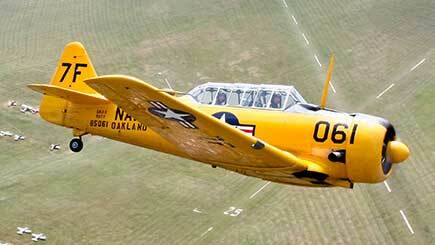 For vintage flying fanatics, an aerobatic flight in a genuine Harvard is hard to beat. 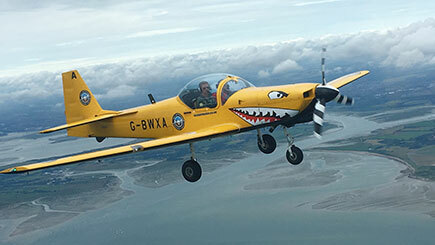 This high flying adventure takes place at the renowned White Waltham Airfield and it offers the chance to fly in the UK's most recently refurbished Harvard. Meet the instructor for a briefing and an introduction to the aircraft before kitting up and climbing into the cockpit to prepare for take-off. Soar through the skies and feel the rush of riding in this vintage beauty while soaking in bird's-eye views. What's more, the instructor performs aerobatic moves including loops and rolls - the ultimate adrenaline rush. There's even a chance to take over the controls during the flight and become honorary pilot - chocks away! Soak in stunning views and hold on tight for a series of stunt moves! Frequent weekdays throughout the year (could be any day between Monday and Friday), excluding the Christmas and New Year period. Minimum height 5' and maximum is 6' 8''. Maximum weight is 18 stone. Minimum age is 16 and maximum age is 85. Participants must be mobile enough to climb in and out of the cockpit. Flying is weather dependent. Any cancelled flights are rearranged for a new date or time. Lasts around one hour, including a briefing. The flight itself lasts for 30 minutes from chocks off to chocks on. Briefings may be shared, but the flight itself is held on a one-to-one basis with an instructor. Please wear warm clothing and comfortable trainers or shoes. All specialist flight equipment is provided.